For the last few years I have picked one project that I think is ridiculous and fun and try to make it happen. I focus on interactive and sustainable projects. Last year it was an Advice Booth made from recycled pallets and doors from The RE Store. I have dreamed of building this giant lite brite for years. The key was figuring out what the pegs would be made of. I was brainstorming at the Sustainable Connections office and someone suggested plastic water bottles. That was the ‘ah-ha’ moment. 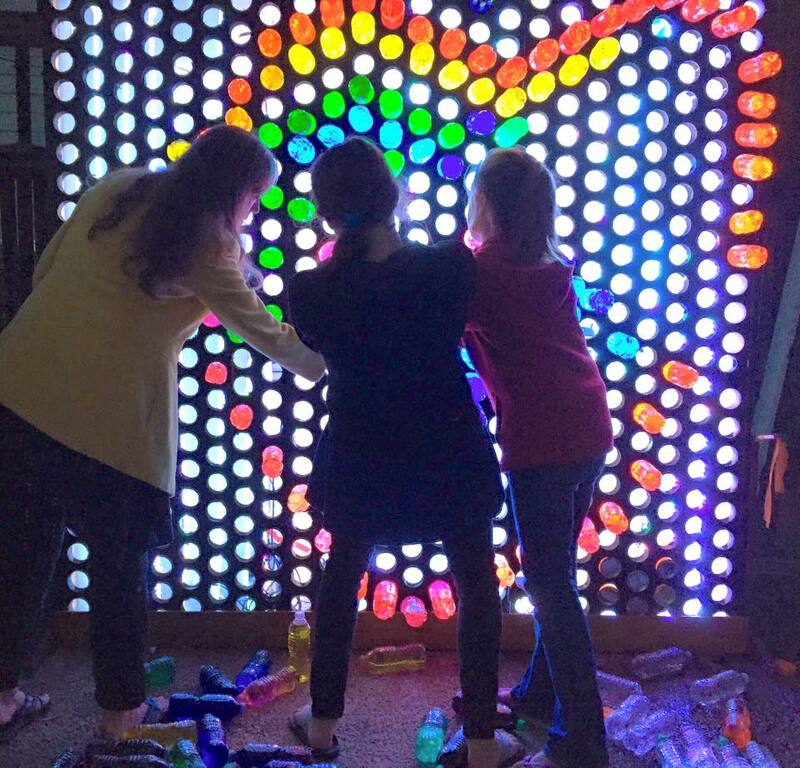 The 8’ x 8’ giant lite brite was constructed out of nearly all reclaimed and recycled materials (lights excluded). Using three hollow core doors, door jams and other odds and ends found at The RE Store, I constructed the light box and used over 350 500ml water bottles filled with colored water to create the pegs. Instead of a static white light, I used RGB LED light strips that change color, fade, flash, and is reactive to music. This adds a new dimension to the 1980’s tiny version. I am happy to report finding that many water bottles wasn’t super easy. I found a couple of good sources and now that I am mostly done collecting them, I can go back to those places and suggest alternatives to those DAMN WATER BOTTLES! Hotels, sporting events/workout gyms, and construction sites were the biggest offenders and contributors.